Fast, clear communication is always good. At your drive-thru, it’s absolutely critical. We’re the largest provider of drive-thru products in the U.S. with more than 60,000 locations served. 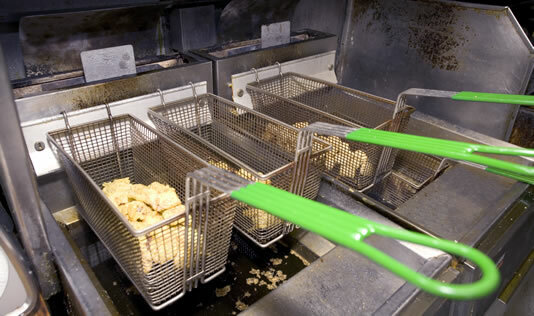 Our drive-thru team understands the unique needs and challenges of the QSR industry, and we offer high performance equipment and full-service maintenance programs that won’t let you down during the rush. Our Drive-Thru systems designers and technicians are factory-trained and certified in 3M, Panasonic and Fast Track systems. MOOD: Des Moines | Iowa Audio Video also offers Drive-Thru Maintenance Programs to keep your systems up and running, including loaner equipment if yours should need repairs. It is our policy to never leave the customer down. MOOD: Des Moines completely understands that things happen, and yes… This is a picture of a deep fryer… But, putting your headset into one of these is still not a good idea! But, again… We know that things happen and when they do, please give us a call for your headset repair needs… or in this case replacement. …and no, they are not tasty! !